What makes UCLA teammates Josiah Johnson and Quinn Hawking different from other benchwarmers? There’s a pause over the phone. The kind of silent, anticipatory gap in TV shows when two people look at one another, then look back at the questioner, and burst into laughter. Johnson and Hawking were Bruins from 2000-04 and 2001-04, respectively, and were both part of the UCLA team that went 22-12 and reached the third round of NCAA Tournament in 2002. Legends is an animated series about the adventures of three high school freshmen who warm the bench for their basketball team and will tackle race, politics and more with a big infusion of comedy. When Hawking and Johnson were playing basketball at UCLA, they tossed around the idea of making TV shows and movies. After college, the pair started working in sports television, and as they learned how to shoot, and edit, writing and producing became second nature. Hawking and Johnson are producers for ESPN and NFL Network, respectively. The duo is joined by Brad Ableson, a longtime artist for The Simpsons, as well as Michael Starrbury, a writer for 2013’s The Inevitable Defeat Of Mister And Pete. The look of the characters? Think Futurama with duller colors and harder lines. And the roots of The Legends of Chamberlain Heights go back to the pair’s LeBron James vs. Kobe Bryant puppet skits, posted to their JerseyChaser.com. The videos brought them so much attention that Nike sponsored the skits as commercials. The look of the characters? Think Futurama with duller colors and harder lines. Benchwarmers can become crowd favorites because they’re the most relatable in terms of talent. For Johnson and Hawking, their time to shine wasn’t during cleanup duty when the Bruins had an insurmountable lead, but when the cameras panned to the bench. Johnson said that he and the S— Crew — the term of endearment the UCLA benchwarmers used to refer to themselves — set the framework for other benchwarmers such as those with Monmouth basketball, who gained national fame with their elaborate celebration routines. Expect to see those kind of antics in the three main characters of Legends. Grover is the best player of the group, but lacks confidence. Milk is white and has integrated himself into black culture. Jamal is a big fella with a Charmin-extra-soft voice and a killer sense of humor. Hawking voices Jamal, while Johnson handles Grover and Milk. “We decided it would be funny if it kind of followed our experiences at UCLA,” Hawking said. Episode 1 focuses on a house party that Grover, Jamal and Milk are trying to get access to — the most clichéd high school experience one could think of — but the catch is that they can only gain entry to the function if they bring drugs. This sends the trio on a humorous mission. 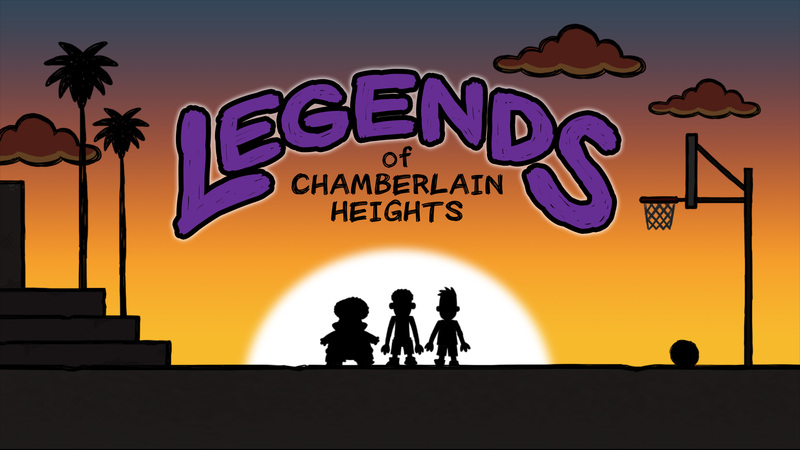 The Legends of Chamberlain Heights premieres following South Park at 10:30 p.m. on Sept. 14.